I bought my first crochet applique for this t-shirt I made a couple weeks ago and I got hooked! 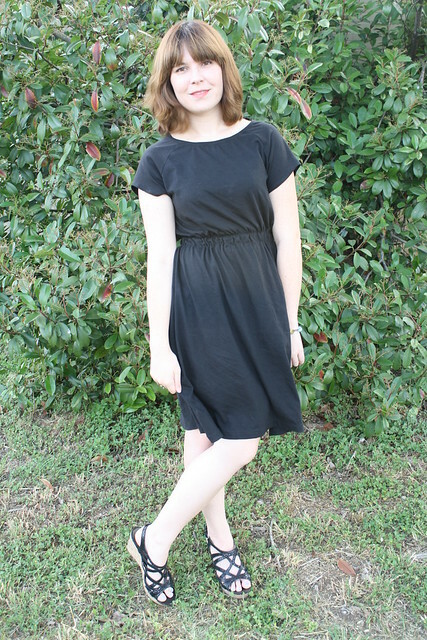 So I bought a few more and added an applique to this simple raglan sleeve knit dress and now I’m going to show you how you can use them on your next project! This is basic a raglan sleeve dress but you could always add appliques to patterns with set in sleeve or anything else. I’m using good ol’ plain black cotton jersey for this project. These types appliques come in all shapes and sizes, some are meant specifically to be front or back yokes but it’s really up to you how you use them. I started with my unassembled cut out pieces. 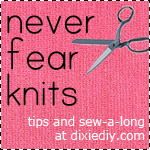 It’s much easier to add an applique before everything is stitched together. I’m using my applique as a back detail like the other shirt. Lay the piece out flat, right side facing up, and arrange the applique on top. One of the problems with appliques is you may have to adapt your pattern to fit your applique and change your neckline. If this were a set-in-sleeve dress I’d just line up the top ends of the applique with the shoulder line. In this case I’m letting it stretch over the raw edge (arrow in the pic above) and I’ll cut it off later when I assemble the dress. Pin around the outer edge of the applique. Now cut out the fabric from behind the applique. I cut big chunks out first, then went back and cut very close to the stitching. Before sewing the pattern pieces together you have to attach any collar or neck finishing to the front. Since my dress has raglan sleeves I sewed the sleeves to the front and added my collar. Because you now don’t need a collar for the back you’ll have to adjust the length of your collar accordingly to only fit the front. After the collar I assembled the rest of the dress. I didn’t fully have a plan for this dress when I began. I started with a basic raglan shirt block and adjusted the sleeves, neckline, and length. Lastly I added elastic to the waist by creating a tube using leftover fabric on the inside of the dress and inserting some 1″ elastic. Not too bad for just winging it! In fact, I’m really quite satisfied with it! Who doesn’t love making a dress in less than a day that fits and looks good? If you want to buy some appliques of your own check out this Etsy shop. AND I’m including an applique in a giveaway next week, along with some ruffle elastic and other goodies so stick around for that! Hope you liked the tute!